The Business Essentials Certificate Program offers a foundation in business principles and skills needed for today’s workplace, in the areas of management, marketing and accounting. The program can be customized by choosing to study business law, information technology, or corporate finance. The four courses are supplemented by two personal effectiveness seminars that help you develop professional skills vital in the business world. To earn a certificate, four courses worth four credits each are required. 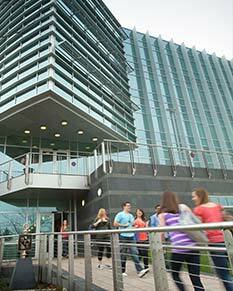 The courses are part of the Anisfield School of Business Professional Core curriculum. The three required courses in accounting, marketing and management are supplemented by a choice of business law, information systems, or corporate finance for a total of 16 credits. Upon completion of these course requirements and two personal effectiveness seminars, students receive a Certificate in Business Essentials from the Anisfield School of Business at Ramapo College of New Jersey. Participation in at least two of the offered Personal Effectiveness Seminars. *Requires additional preparation – see course description. Current non-business-major RCNJ students in Good Academic Standing are automatically eligible for the Business Essentials Certificate Program, and should use the Major/Minor Declaration Form available through the Registrar’s Office to enroll in this program. Click on “Change of Major/Minor” to access the form. Attendance is required at two of several personal effectiveness seminars which provide valuable, relevant skills that are immediately useful. The non-credit seminar topics include time management, personal branding, and working with emotional intelligence. The seminars are offered on a single evening in the summer and occasionally during the academic year. The College will verify completion of the program to potential employers or other parties, as requested by the student. All certificate requirements must be completed at Ramapo College of New Jersey; transfer credits cannot be used to satisfy these requirements. In addition, all certificate requirements must be completed within five years of acceptance to the program. Non-business majors enrich their academic experiences and broaden their career prospects by developing a working knowledge of fundamental business concepts. Individuals seeking a career change or applying for a business oriented position would benefit from the program as well as a college graduate with a non-business degree preparing for an MBA program. The certificate may be completed during one or two summers, and Business Essentials students are guaranteed seats during the Summer Sessions. Sections of each course are offered at convenient times, including either online or in the evening. Some of the courses for Business Essentials are also offered online during the College’s four week Winter Session – a convenient and streamlined alternative. Normal undergraduate tuition and tuition related fees apply to all academic courses (Tuition Information). In addition, all relevant non-tuition related charges (e.g., parking fees, dishonored check fees, etc.) apply. Q: What are the requirements for the Business Essentials Certificate? To earn a certificate, four (4) four-credit courses are required. Three of the courses are required of all certificate students and the fourth required course offers enrollees options. The three required courses are Principles of Financial Accounting (ACCT221), Marketing Principles and Practices (MKTG290) and Managing Organizational Behavior (MGMT302). For the fourth course, you may choose one of the following courses: Business Law I (BADM223), Principles of Information Technology (INFO224) or Corporate Finance I (FINC301)*. In addition to the credit-bearing courses, you must attend two out of three non-credit Personal Effectiveness Seminars. Q: Who can take the Business Essentials Certificate Program? College Students: Non-business majors enrich their academic experiences and broaden their career prospects by developing a working knowledge of fundamental business concepts. Adult Learners: Individuals seeking a career change or applying for a business-oriented position would benefit from the program as well as a college graduate with a non-business degree and those preparing for an MBA program. Q: How long does the certificate take to complete? The Business Essentials Certificate can be completed at your own pace. Sections of each course are offered at convenient times, including either online or in the evening. The certificate can also be completed during one or two summers. Business Essentials students are guaranteed seats during summer sessions. Some of the required courses are also offered online during the College’s four-week winter session. Q: Who do I contact if I have difficulty registering for a course? If you are having trouble with registration and/or need a permit to register for a course, please contact Karen Norton at (201) 684-6653 or knorton@ramapo.edu. Q: Is the Business Essentials Certificate eligible for financial aid? If you are a current Ramapo College student receiving aid, the required classes are part of your normal course schedule, therefore are paid through your college account. Please contact the Office of Financial Aid at (201) 684-7549 to see how many credits you are covered for through financial aid. If you are not a matriculated Ramapo College student, this program is not eligible for financial aid because it is a non-degree program. The courses for the Business Essentials Certificate are all credit-bearing Ramapo College courses and tuition is established annually by the Board of Trustees. The cost per credit is dependent on the semester in which courses are taken, as well as in-state or out-of-state status. To view the tuition cost per credit, please visit the Office of Student Accounts website at https://www.ramapo.edu/student-accounts/costinfo/. Q: Will I receive a transcript after completing this program? Yes, all required courses taken as part of the Business Essentials Certificate program are recorded on your Ramapo College official transcript. Once completed, your certificate is noted as earned on your Ramapo transcript. Transcripts may be requested online on the Registrar’s website at https://www.ramapo.edu/registrar/. For payment information, contact the Office of Student Accounts.